The Cologne-Bonn system after the inauguration of the north/south tram tunnel in the centre of Cologne. Bonn Stadtbahn (LRT): 23 km. Horse tramways (Cologne): 28 Apr. 1877 - 22 May 1907. 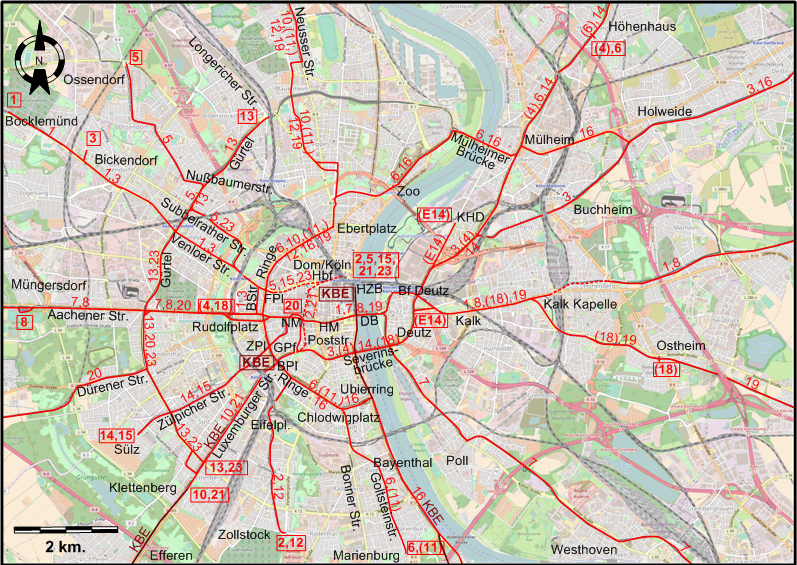 Electric tramways (Cologne): 15 Oct. 1901 - today. 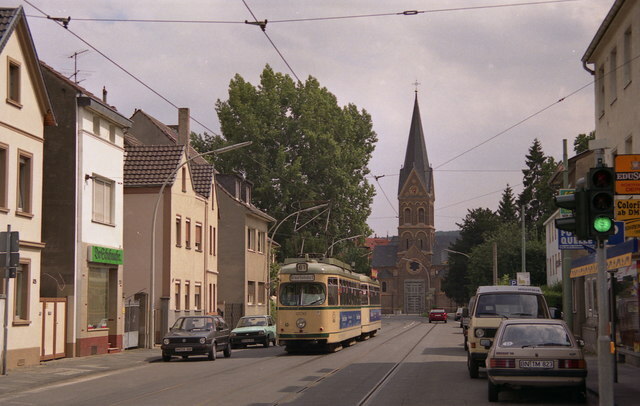 Electric tramways (Bonn): 1902 - today. Querbahn (Brühl - Wesseling - Köln-Godorf Hafen): 31 March 1901 - (electric: 1920 -) 30 May 1981. Rheinuferbahn (Cologne - Bonn, electrified from the beginning): Jan. 1906 - today. Schwarze Bahn (Cologne - Sülz – Berrenrath, never electrified): 19 Dec. 1918 - 13 Dec. 1968. Vorgebirgsbahn (Cologne - Brühl - Bonn): 1 Aug. 1897 - (electric: 1929 -) today. 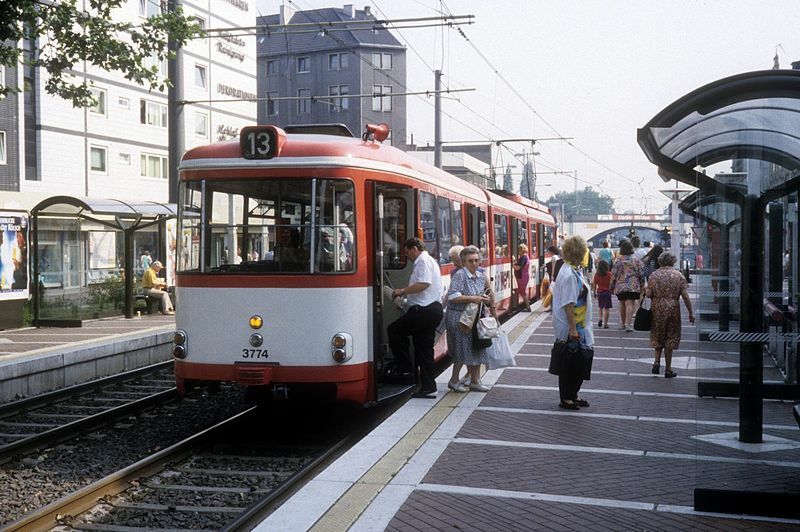 Stadtbahn (LRT standard) (Cologne): 25 Aug. 1974 - today. 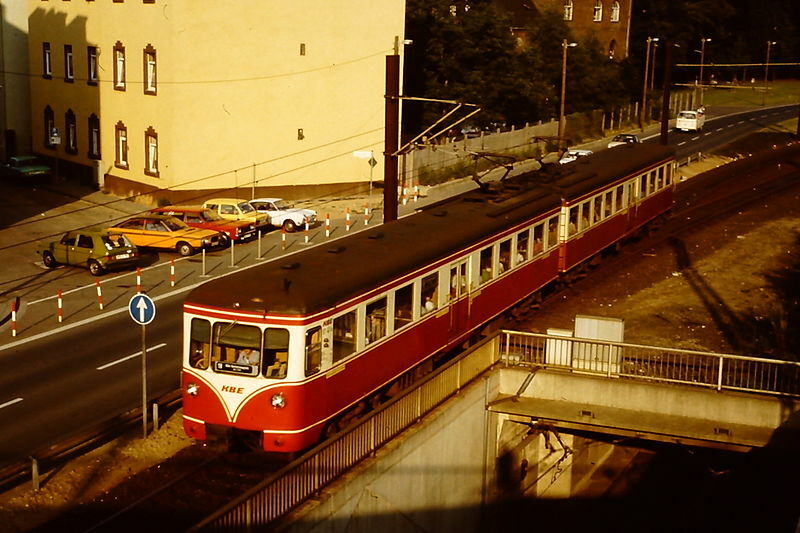 Stadtbahn (Cologne-Bonn service along the Rheinuferbahn): 12 Aug. 1978 - today. 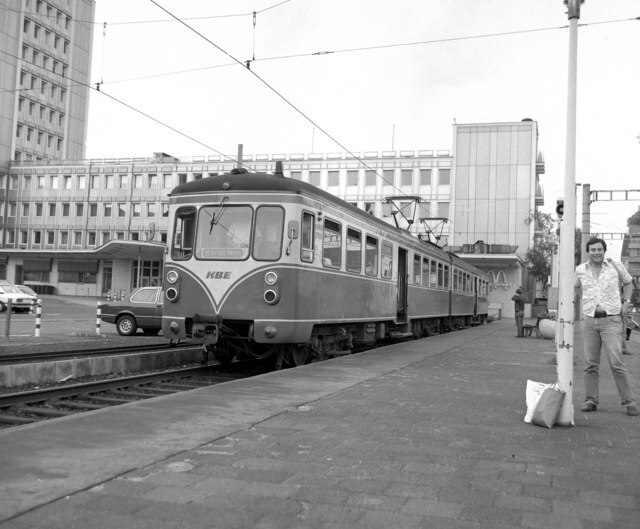 Stadtbahn (LRT standard) (Bonn): 22 March 1975 - today. Steam tramway (Bad-Godesberg - Mehlem): 22 May 1892 - 1911. The Straßenbahn-Museum Thielenbruch is a museum dedicated to the history of tramways in Cologne. Brauer, T. & Schiefelbusch, M. "Köln: Private funding for public transport", Tramways & Urban Transit, Sept. 2018 (81:969), p.340-343. Hendlmeier, W. Handbuch der deutschen Straßenbahngeschichte: Erster Band - Text und Abbildungen.München: Selbstverlag, 1981. Pagel, M. & Taplin, M.R. Tramways of Western Germany. Hassocks (England): Light Rail Transit Association, 3rd ed., 1980. Ross, D. "Köln: Pferdebahn to Stadtbahn. Part 19: Postscript - The future", Modern Tramway & Light Rail Transit, June 1988 (51: 606), p.191-198. Pulling, N. "Systems Factfile No.35: Köln, Germany", Tramways & Urban Transit, Aug. 2010 (73: 872), p.299-301. Straßenbahnatlas 2005 - Deutschland. Berlin: Arbeitsgemeinschaft Blickpunkt Straßenbahn e.V., 2005. Tudor, D. "Köln: Pferdebahn to Stadtbahn. Part 1: Genesis (1877-1901)", Modern Tramway & Light Rail Transit, Jan. 1985 (48: 565), p.2-10. Tudor, D. "Köln: Pferdebahn to Stadtbahn. Part 2: Expansion (1901-1914)", Modern Tramway & Light Rail Transit, March 1985 (48: 567), p.74-88. Tudor, D. "Köln: Pferdebahn to Stadtbahn. Part 3: Interurbans - The Golden Age", Modern Tramway & Light Rail Transit, June 1985 (48: 570), p.187-202. Tudor, D. "Köln: Pferdebahn to Stadtbahn. Part 4: Through crisis to confidence (1914-1929)", Modern Tramway & Light Rail Transit, Aug 1985 (48: 572), p.254-274. Tudor, D. "Köln: Pferdebahn to Stadtbahn. Part 5: Rationalisation (1930-1939)", Modern Tramway & Light Rail Transit, Nov. 1985 (48: 575), p.369-380. Tudor, D. "Köln: Pferdebahn to Stadtbahn. Part 6: Modernisation (1930-39)", Modern Tramway & Light Rail Transit, March 1986 (49: 579), p.83-92. Tudor, D. "Köln: Pferdebahn to Stadtbahn. Part 7: The route to disaster (1939-45)", Modern Tramway & Light Rail Transit, Apr. 1986 (49: 580), p.119-132. Tudor, D. "Köln: Pferdebahn to Stadtbahn. Part 8: Zero hour and after", Modern Tramway & Light Rail Transit, June 1986 (49: 582), p.193-203. Tudor, D. "Köln: Pferdebahn to Stadtbahn. Part 9: From dust and ashes (1948-53)", Modern Tramway & Light Rail Transit, Aug. 1986 (49: 584), p.263-275. Tudor, D. "Köln: Pferdebahn to Stadtbahn. Part 10: Confidence restored (1954-58)", Modern Tramway & Light Rail Transit, Oct. 1986 (49: 586), p.333-346. Tudor, D. "Köln: Pferdebahn to Stadtbahn. Part 11: Building for the future (1959-62)", Modern Tramway & Light Rail Transit, Dec. 1986 (49: 588), p.413-424. Tudor, D. "Köln: Pferdebahn to Stadtbahn. Part 12: The Düwag Age begins (1963-68)", Modern Tramway & Light Rail Transit, Feb. 1987 (50: 590), p.48-58. Tudor, D. "Köln: Pferdebahn to Stadtbahn. 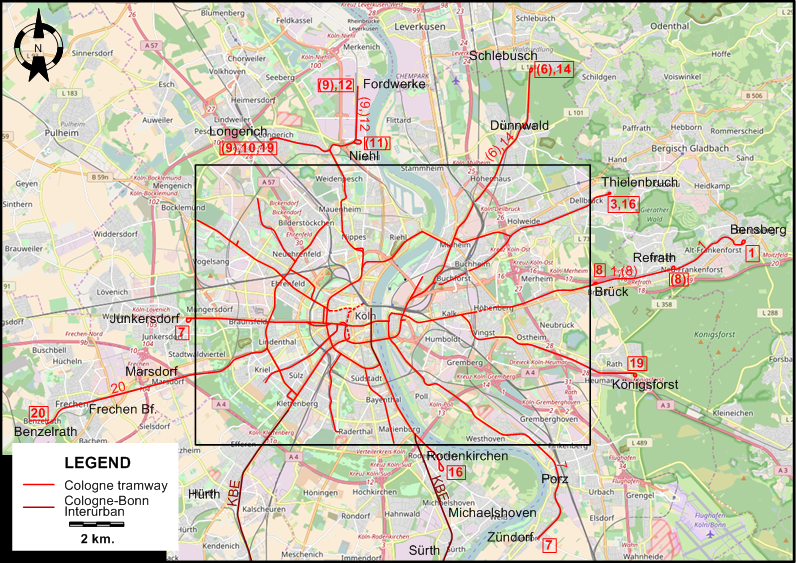 Part 13: Into the U-Bahn (1969-72)", Modern Tramway & Light Rail Transit, Apr. 1987 (50: 592), p.114-129. Tudor, D. "Köln: Pferdebahn to Stadtbahn. Part 14: Another era dawns (1973-76)", Modern Tramway & Light Rail Transit, June 1987 (50: 594), p.183-193. Tudor, D. "Köln: Pferdebahn to Stadtbahn. Part 15: Stadtbahn - From plan to reality (1977-9)", Modern Tramway & Light Rail Transit, Aug. 1987 (50: 596), p.264-273. Tudor, D. "Köln: Pferdebahn to Stadtbahn. Part 16: Marriage of convenience (1980-83)", Modern Tramway & Light Rail Transit, Oct. 1987 (50: 598), p.327-336. Tudor, D. "Köln: Pferdebahn to Stadtbahn. 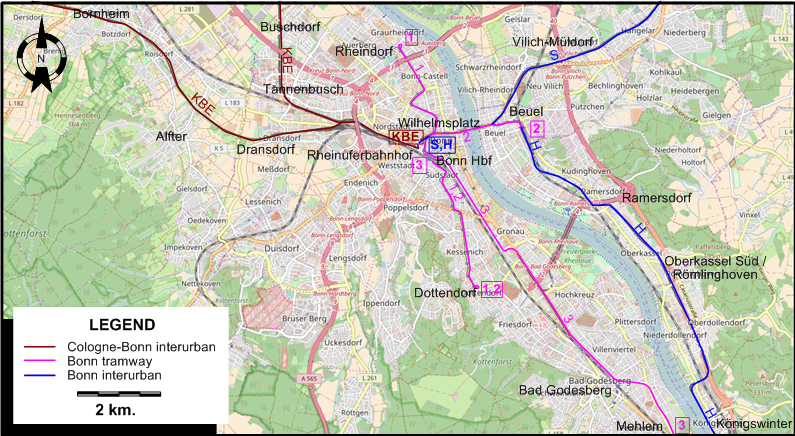 Part 17: The Stadtbahn expands (1983-87)", Modern Tramway & Light Rail Transit, Feb. 1988 (51: 602), p.51-63. Tudor, D. "Köln: Pferdebahn to Stadtbahn. Part 18: Integration and wider horizons (1984-7)", Modern Tramway & Light Rail Transit, Apr. 1988 (51: 604), p.129-138. Wansbeek, C.J. 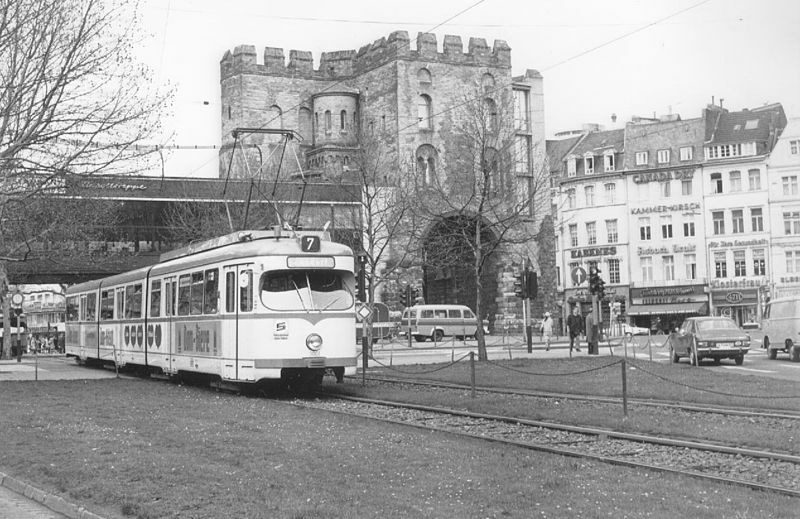 "Bonn: The old capital is alive and kicking", Tramways & Urban Transit, March 2006 (69: 819), p.90-93. Wansbeek, C.J. 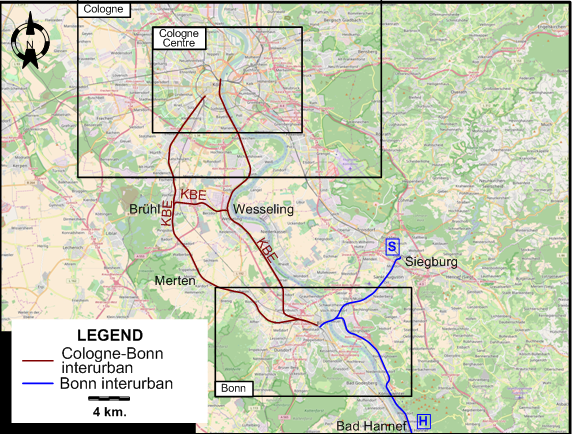 "Köln relies on light rail", Tramways & Urban Transit, Apr. 1999 (62: 736), p.132-135. Wyse, W.J. "Germany goes underground. 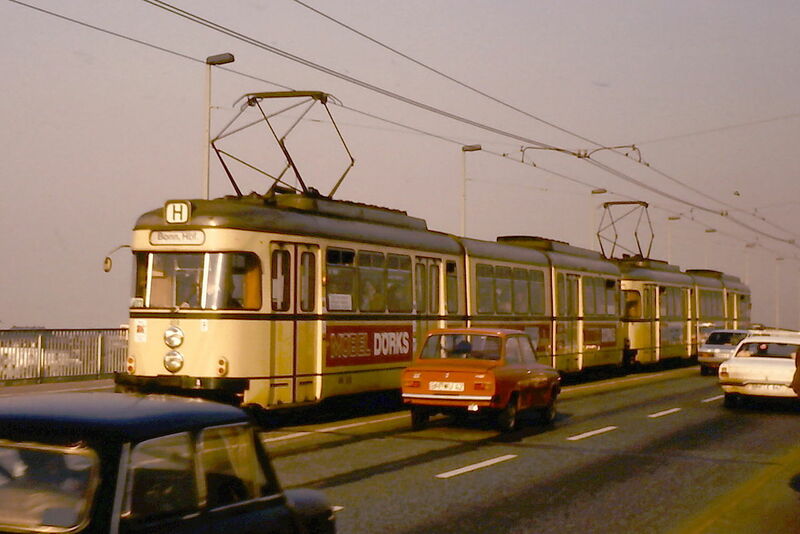 Part 8: Bonn joins the club", Modern Tramway & Rapid Transit Review, Nov. 1975 (38: 455), p.377-385. Wyse, W.J. "Rapid transit par excellence: The Köln-Bonner Eisenbahnen A.G.", The Modern Tramway, June 1960 (23: 270), P.123-127. Also, thanks to Peter Zondag, of De Bilt (Netherlands), for further information provided through personal communication.